DODD, EDMUND MURRAY, lawyer, politician, and judge; b. at Sydney, Cape Breton, 9 Jan. 1797, son of Archibald Charles Dodd and Susannah Gibbons; d. at Cow Bay (Port Morien), N.S., 27 July 1876. Edmund Murray Dodd served as a midshipman in the British navy during the War of 1812 and was a prisoner of war for a time. During the 1820s he practised law in Sydney. In 1826 he married Mary Ann Sarah Weeks, who died within a few years, and in 1830 he was married again, to Caroline Maria Ritchie, by whom he had several children. Dodd was elected to the Legislative Assembly of Nova Scotia in 1832 as the first member for Sydney Township. He soon joined Tories James William Johnston, Mather Byles Almon, Alexander Stewart*, and Simon Bradstreet Robie* in their opposition to the attempts of Joseph Howe and Herbert Huntington* to introduce a system of party government. Despite their political differences Dodd and Howe appear to have been personal friends. Howe sought his advice when threatened with a duel in 1838 – perhaps because Dodd had taken part in a bloodless duel in Halifax not long before. Dodd’s appointment to the Executive Council in 1838, and his elevation to the post of solicitor general six years later, cemented his alliance with the Tories. During the ill-fated coalition government of Lieutenant Governor Falkland [Lucius B. Cary*], Dodd’s relations with Howe and the Reformers deteriorated steadily. In 1842 Dodd attempted to heal the breach between the Tories and Reformers in the Executive Council when he declared that the council was responsible to both the governor and the assembly. In spite of this “Confession of Faith,” as the Reformers labelled it, Dodd was soon leading the Tory attack on the Reformers whom he regarded as a group of place-hunting trouble-makers. With savage humour Howe returned the attack, lampooning Dodd as an obsequious lackey of the governor and as one of the “geese” whose “cackling” had wrecked the coalition. From 1842 to 1848 Dodd was a judge of probate as well as solicitor general. With his elevation in 1848 to puisne judge of the Supreme Court of Nova Scotia, he left the political arena. Despite his acknowledged ability as a lawyer, he was not a particularly successful judge. Increasing deafness combined with a tendency toward tedious and verbose explanation handicapped him on the bench. His family life was marred with tragedy: a lawyer son was shot to death in Sydney by the father of a girl whom he had raped but refused to marry. The physical infirmities of old age hampered Dodd’s activity during his last five years in the Supreme Court. The Liberal legislature, resenting the pro-confederation stand taken by most of the province’s judges and lawyers, refused to appoint new judges. Dodd remained on the bench until 1873 when he was finally allowed to retire. [Joseph Howe], Speeches and letters (Chisholm), II, 160, 210, 387, 456–59, 467–68, 515–17, 522. Directory of N.S. MLAs (Fergusson). David Allison, History of Nova Scotia (3v., Halifax, 1916), II, 704. Beck, Government of N.S., 288. 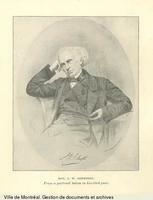 [Joseph Howe], Joseph Howe, voice of Nova Scotia, ed. and intro. J. M. Beck. (Toronto, 1964), 87. George Patterson, Studies in Nova Scotian history (Halifax, 1940), 78; More studies in Nova Scotian history (Halifax, 1941), 65, 87. Benjamin Russell, “Reminiscences of the Nova Scotia judiciary,” Dal. Rev., V (1925–26), 499, 509. A. A. Mackenzie, “DODD, EDMUND MURRAY,” in Dictionary of Canadian Biography, vol. 10, University of Toronto/Université Laval, 2003–, accessed April 24, 2019, http://www.biographi.ca/en/bio/dodd_edmund_murray_10E.html.